Dee Dee Winfield and meat. 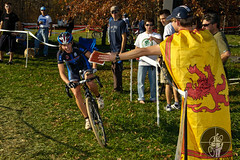 Tacchino Cyclocross, the first race in the BikeReg.com MABRAcross Super 8 Series, is this Sunday and I’ve been told several times by Jim “Unholy Promoteur” McNeeley that a course preview wouldn’t be worth the ones and zeros it was recorded on because the course is unrecognizable from last year’s edition. We know that the course Squadra Coppi has in store for us will be run in reverse, there will be a run up on something called “Hup Hup Hill,” which is one of those things that sounds more pleasant than it actually is, and it’s supposed to be hard. On the plus side, when you’ve finished racing, or if you come out for the spectating, the run up will have a party tent featuring DJ Adam Austin. And, as always, there will be sausage premes (with Tofurkey), and a kitted out turkey, who may or may not have fallen off the wagon. Instead of trying to go through last year’s video and point out all the things that are different, I will merely post the image stabilized helmet-cam from the 2010 race and let you enjoy the sunny pastoral environs. Because if the weather gods have their way, sunny is not in the cards for tomorrow. Make sure to pack your Wellies, a poncho and two pairs of shoes (you will thank me for this extra pair of shoes when you get back to your car for the drive home). Also bring a couple large plastic trash bags to throw all of your muddy things into. Seriously, after you finish racing, strip down throw it all into the bag—kit/shoes/gloves/helmet/glasses/towels/regrets—tie it up and throw it in the car. Bring some baby wipes for you (using a couple on your poor muddy bike after hosing it down won’t hurt either), and then go enjoy the races. When you get home, dump the contents of the plastic trash bag out on the lawn or driveway, hose it all down and then throw it in the wash. Just make sure you don’t forget about that muddy, grungy Hefty bag of ick sitting in the car for too long. Discovering it as you pack your car for next week’s races is not recommended. Here’s the 2010 Tacchino video. Thanks for watching and see you tomorrow at the races.